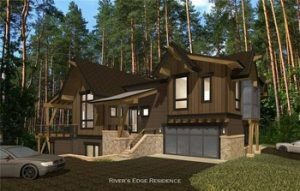 River’s Edge are new luxury duplex homes for sale in Breckenridge, Colorado real estate. These Breckenridge homes offer Blue River frontage, mountains views, and a fantastic location a short distance to Breckenridge’s historic Main Street. Embraced by old growth spruce trees and protected wetlands, this neighborhood offers seclusion while only minutes to downtown. Residences at River’s Edge are all duplexes with 4 bedrooms, 4.5 bathrooms and 2.803 square feet. Each of these Breckenridge properties offer finished basements, 2-car garages, Wolf & Sub-Zero appliances and designer finishes throughout. When you own a property at River’s Edge in Breckenridge, Colorado the HOA dues will include all exterior maintenance so you can come to your 2nd home and enjoy. If you’re considering purchasing a luxury home in Breckenridge, Colorado, or would like more information on River’s Edge including floorplans and finishes, contact Justin & Krystal Knott at 970.333.9050 or knott@sothebysrealty.com at LIV Sotheby’s International Realty.